AUTHORITIES MUST take the air pollution problem in Bangkok seriously and strictly enforce mitigation measures to protect people’s health, academics said, while warning of serious financial costs to match. They pointed out that the country would face billions of baht in additional health costs unless the severe air pollution blanketing the capital was promptly curbed. The pollution continued to remain at harmful levels for the third straight day yesterday and the situation was likely to remain critical for at least another month due to weather patterns, said Witsanu Attavanich, associate professor of economics at Kasetsart University. He feared both state agencies and the public were largely underestimating the dangers of air pollution and proper prevention and mitigation measures were still inadequate. Bangkokians awoke yesterday morning to find their city once again smothered by thick smog that reduced visibility to just one kilometre in some areas. It was not regular winter fog but a deadly cloud of fine dust particles and other air pollutants, according to China-based air-pollution monitoring website http://aqicn.org. 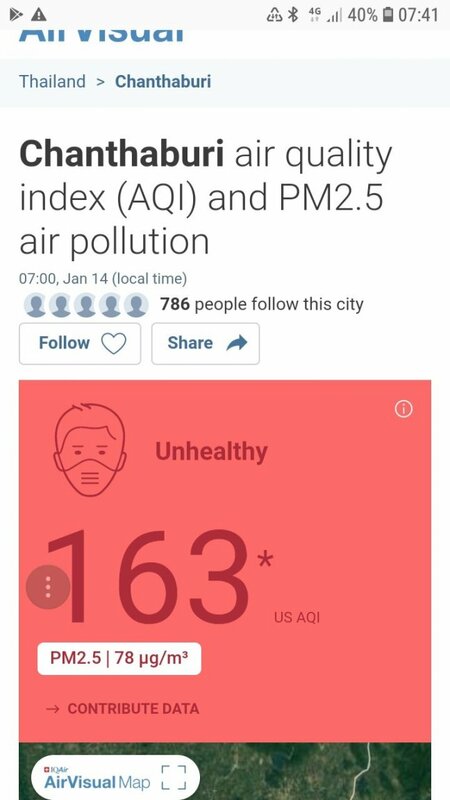 The site reported that the PM2.5 air-quality index (AQI) in Bangkok yesterday reached a peak of 195, an unhealthy level, while some areas such as Bang Khen district were at hazardous levels, with PM2.5 AQI at 394 yesterday morning. The site forecast that Bangkok would face harmful levels every morning for the rest of the week because there was little wind. Nevertheless, people wearing facemasks remained a rare sight around the capital. Many children and seniors could be seen going about their outdoor activities as usual. “Air pollution is really a silent killer and many Thais underestimate the danger to their health, so not many people protect themselves by wearing a facemask or installing air purifiers at home,” Witsanu said. According to his research on pollution-related health costs in 2017, every microgram of PM10 beyond the safe limit cost the people of Bangkok up to Bt18.42 billion in medical expenses. Metropolitan Administration [BMA] and Pollution Control Department [PCD] already have mitigation measures to tackle the problem. But our question is whether these measures are being strictly implemented and whether they can truly mitigate the problem,” he said. Witsanu emphasised the importance of the authorities taking air pollution seriously and immediately tackling the problem at its root. He called for monitoring construction sites and limiting cars on the streets, rather simply telling people to wear facemasks. He urged everyone to spread the word about air pollution. Environmental-health expert Sonthi Kotchawat cautioned that PM2.5 was so harmful because it’s very fine dust particles, small enough to pass through the lungs and enter the bloodstream. Long exposure can cause respiratory diseases, including lung cancer, heart disease and stroke, he said. Sonthi said it was important to mitigate air pollution at its roots by controlling outdoor burning, implementing pollution controls in the transportation sector and curbing the use of fossil fuels. He urged the PCD to not merely issue warnings, saying its officials are obligated by law to mitigate the pollution at its source and protect the environment and public health. BMA Environment Department director Chatree Wattanakhajorn said his agency has issued a ban on outdoor burning, was monitoring pollution-control measures at all construction sites, and was constantly cleaning the roads. The Pollution Control Department has introduced measures to improve its system for measuring air quality, but Greenpeace Thailand country director Tara Buakamsri said there is still room for improvement to ensure safe air. Here are his suggestions. 1 Update safe-air standards in line with World Health Organisation recommendations. 2 Set air pollution emission standard for power plant chimneys. 3 Promote the use of clean, renewable fuels in the transportation sector. 4 Improve public transit with broader access and more extensive coverage. 6 Give people incentives to walk, ride bicycles and switch to electric vehicles. 7 Provide easy public access to the pollution monitoring system. 8 Add more urban green space as much as possible. With air pollution in the capital continuing to intensify, residents should follow this checklist to safeguard their health. - Stay indoors as much as possible – especially the elderly, children and people already ailing. - Regularly monitor the air pollution level. - Wear an N95 face mask while outside – it filters out PM2.5. - Keep doors and windows closed at all times. - Change your clothes and take a shower immediately on returning home from outside. Bad enough that it's Monday morning. I know someone who teaches at a Japanese school in BKK. The students have been kept indoors at the school for weeks. No playing outside etc. At my school, we had extra long assemblies or line ups outsde last week. The kids had even more time to breathe in that dirt. High smog levels are meadured in Rayong, Pattaya, and deep into Esan. I wonder how long it will take for those in charge to acknowledge the real source of this brown cloud. Monday morning, Bangkok is at 117 ug/m3, almost 5 times the international safety limit. Keep your kids indoors today! 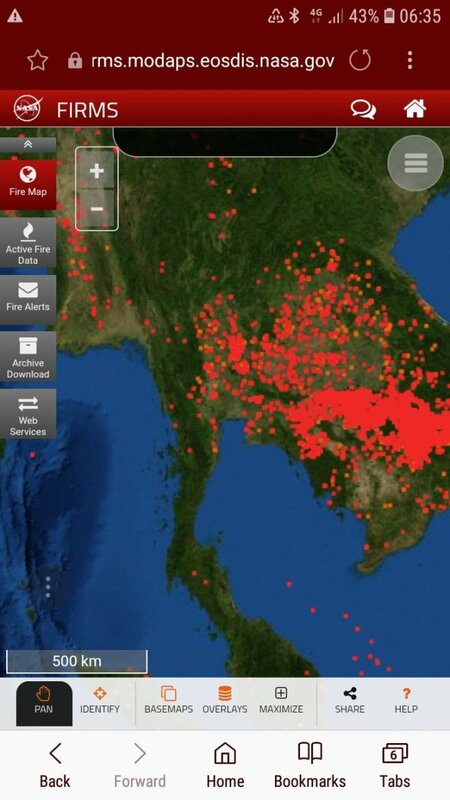 Why so many fires everywhere? Is there an out of control bushfire everywhere? Perhaps educating the farmers to stop burning crop residue would be one step in the right direction. Maybe all those magazines etc who give out awards for bestest of the best that TH keep winning could come back for a visit. Waiting for T.A.T. to spin this in a positive way to attract tourists. Those fires are one of the reasons that rice, sugar and corn cost near to nothing in the supermarkets, even after the agro corp's cut. Chantaburi, the well known green suburb of Bangkok, is apparently also affected by the city's construction dust. Another serious issue that will never, ever be resolved. Same story every year for the last 13 years, nothing happens. So who cares?